Shipping is an industry contributing to almost 90 per cent of the volume of world merchandise transportation trade. Globalization has been a major driver towards the immense growth of world trade followed by increasing integration of maritime transport in the world economy being the most reliable and economical transport mode. By continuous expansion of world seaborne trade it becomes more significant to improve the trend by increasing service coverage, productivity of ships and optimizing the port throughput, etc. Connecting to global shipping networks is the key for countries’ participation in globalized trade. Although it looks straightforward, the real connections are a complex network and optimizing this network to ensure best possible connections would mean great economies of scale and vast growth for the shipping industry in particular and the world trade as well as the world economy in general. An economic crisis is a long term economic state characterized by unemployment and low levels of trade and investment. The current global economic crisis which started from the United States was originally considered as a concern only for the US with minor short run impacts on countries with advanced economies. However by persisting and broadening the pressure it touched almost all countries, both developed and developing ones. The recent economic crisis caused great credit crunches and as a result high instability in prices followed by a harsh decline in demand. Loss of consumers’ confidence led to a dramatic slump of consumption, production and investment. The shipping industry being the main and cheapest mode of transport for world merchandise trade was not immune from this brunt and experienced a severe hit in an unexpected short period. Blend of cyclical nature of markets in shipping, rapid consequences of economic downturn and dynamics of oil prices caused notable imbalance in trade volume and fleet capacity and severe decline in freight rates. 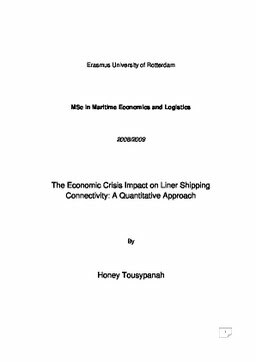 The aim of current research is to study economic impacts of liner shipping connectivity, as a significant element of port or country connectivity, and then to examine how the current economic crisis influences shipping in general and the liner shipping sector in particular. Further it will discuss how this affects countries’ incorporation into the liner shipping network and countries maritime connectivity in long run. For this research and analysis the author used the data on liner shipping connectivity for 162 countries from 2004 to 2009 from the United Nations Conference on Trade and Development (UNCTAD) which is derived from Containerization International. The trend of growth for liner shipping connectivity for countries from 2004 is also highlighted when the data is available. The possible impacts of the economic slowdown on the contribution of liner shipping connectivity to economy as well as possible options for liner companies to cope with the current economic downturn have also been discussed.